Objective To evaluate the effects of prior abdominal surgery and obesity and the level of spine exposure on the technical aspects and complications of anterior retroperitoneal exposure of the lumbar spine (ARES). Design Retrospective review of prospective database. Setting Academic vascular surgery practice. Patients Patients undergoing ARES from 2001 to 2011. Main Outcome Measures Influence of prior abdominal surgery, obesity, and level of exposure on time to spine exposure and incidence of vascular and perioperative complications. Results Four hundred seventy-six patients underwent ARES. Mean (SD) age was 47.7 (12.6) years; 46.6% had undergone prior abdominal surgery. Mean (SD) body mass index (BMI) was 28.3 (5.5); 61.6% of procedures included the L4-5 disk. Mean (SD) time to exposure was 70.0 (25.5) minutes. Vascular injury occurred in 23.3% (3.8% major). Perioperative complications occurred in 16.4% of cases. Prior abdominal surgery had no effect on time to exposure, vascular injury, and perioperative complications. A BMI of 30 or more had no effect on time to exposure compared with a lower BMI. A BMI of 30 or more led to higher rates of vascular injury (30.8% vs 19.7%; P = .007) and overall complications (21.4% vs 14.0%; P = .04). Exposures involving L4-5 led to increased time to exposure (77.0 vs 56.2 minutes; P < .001) and higher rates of vascular injury (29.7% vs 13.1%; P < .001) but had no effect on overall complications compared with exposures for other levels. Conclusion Prior abdominal surgery should not be considered a contraindication to ARES. Caution is warranted in obese patients and exposures involving L4-5. Anterior retroperitoneal exposure of the lumbar spine (ARES) is a frequently used technique in the performance of anterior lumbar interbody fusion and lumbar total disk replacement. General and vascular surgeons often act as “exposure surgeons” for these cases in a 2-team approach with the spine surgeons. Lumbar spine operations are increasingly being performed in the United States, with spending on lumbar fusion increasing more than 500% in the past decade.1,2 The clinical indications for these procedures are well described for the spine surgeon. However, for the exposure surgeons, the anatomic limitations of the anterior retroperitoneal exposure are not well defined. Obesity and prior surgery are known to increase the technical difficulty and complication rates of diverse surgical procedures including colon, vascular, plastic, and orthopedic operations.3-7 While obesity may increase the risk of spinal surgery, obese patients may still gain real benefit from spinal surgery.8-10 However, obesity is known to directly increase the difficulty of obtaining exposure from an anterior approach.7 Similarly, prior abdominal surgery may affect the ability to perform an anterior exposure of the spine because of abdominal wall adhesions, even when using a retroperitoneal approach. The effects of prior abdominal surgery and obesity may involve increased time to exposure of the spine, increased rates of intraoperative vascular injuries, and increased perioperative complications. The most common levels of lumbar fusion involve the L4-5 and L5-S1 disks. Our group has previously reported that L4-5 exposure is more likely to require vascular manipulations and increase the risks of vascular injuries compared with L5-S1 spinal exposures.11 Thus, prior abdominal surgery, obesity, and spinal level all play a role in the decision-making process of the exposure surgeon. The technical difficulties of ARES may be quantified by the time taken to obtain the exposure as well as the resultant rates of complications. We sought to address the influence of prior abdominal surgery, obesity, and involvement of L4-5 exposure on time to exposure, vascular complications, and perioperative complications when performing ARES. A retrospective review of a prospective database was performed to identify all spine cases performed between August 1, 2001, and August 31, 2011. Procedures included all elective ARES combined with anterior lumbar interbody fusion and/or total disk replacement performed for benign, degenerative spinal pathology. The indication for surgery, patient demographics, levels of exposure, and patient risks including body mass index (BMI) (calculated as weight in kilograms divided by height in meters squared) and prior abdominal operations were specifically recorded. Prior abdominal surgery was divided into 4 subtypes: total abdominal hysterectomy/cesarean section, laparotomy/colectomy, laparoscopic surgery, and open appendectomy/inguinal hernia. Time to exposure was defined as the time from skin incision to start time for the spinal procedure as recorded in the operative report. Minor vascular injury was defined as any procedure requiring monofilament suture repair of a vascular structure. Major vascular injuries were defined as any vascular injury with associated blood loss greater than 200 mL3 or requiring more than simple suture repair. The occurrence of a minor vascular injury was not considered a perioperative complication; however, major vascular injuries were considered perioperative complications. Perioperative complications (ileus >5 days, transfusion, reoperation, paresthesia, thromboembolic event, or other cardiac, pulmonary, urinary, or wound complications) were noted. The standard operative approach used during the study period has been previously reported.11 A 2-team approach was used with a vascular surgeon and an orthopedic or neurosurgical spine surgeon. With the patient in the supine position, a lower abdominal transverse incision was performed for single or 2-level exposures. A rectus-sparing retroperitoneal approach was used with medial mobilization of the left ureter. Exposure of the L5-S1 disk was routinely obtained below the confluence of the iliac veins. Exposure of the L4-5 disk was obtained either above the left common iliac artery, between the left common iliac artery and vein, or below the left common iliac vein depending on patient anatomy. A left vertical paramedian incision was performed when the L3-4 disk or higher levels were exposed. The paramedian approach provided a similar retroperitoneal exposure after a left vertical paramedian incision and lateral mobilization of the left rectus muscle. The main outcome variables analyzed were time to spinal exposure, incidence of vascular injury, and perioperative complication rate. The influence of prior abdominal surgery, BMI, and level of exposure on these outcomes was evaluated by χ2, t tests, analysis of variance, and logistic regression analysis using NCSS software (NCSS 2007 for Windows). All P values were considered significant at P < .05. The study was approved by the institutional review board at Loma Linda University Medical Center. During the study period, 476 procedures were performed. The indications for surgery and patient demographics are shown in Table 1. Mean (SD) BMI was 28.3 (5.5); obesity, defined as a BMI of 30 or more, was present in 33.6% of patients. Prior abdominal surgery had been performed in 46.6% of patients. Prior operations included total abdominal hysterectomy/cesarean section (24.6%), laparotomy (9.5%), and laparoscopic procedures or appendectomy/inguinal hernia (12.6%). Prior surgery directly affecting the retroperitoneum occurred in 15 patients (3.2%) and included prior ARES in 9 patients and left nephrectomy in 6 patients. The spinal levels exposed included L4-5 in 61.6% (Table 2). The mean (SD) time to spinal exposure was 70.0 (25.5) minutes. There were 18 major vascular injuries and 93 minor vascular injuries for an overall rate of 23.3%. The 18 major vascular injuries required the following repairs: arterial replacement (1), arterial debridement and reanastomosis (1), arterial repair with a felt pledget (2), and complex repairs of venous injuries using monofilament suture (14). All minor vascular injuries were treated with simple monofilament suture repair. Forty-five percent of vascular injuries occurred during exposure and 55%, during instrumentation. Of the major vascular injuries, 2 of 18 (11.1%) occurred during exposure and 88.9%, during instrumentation. Perioperative complications occurred in 16.4% of patients, with the most common nonvascular complication being prolonged ileus (Table 3). When evaluating the influence of prior abdominal surgery, patients who had undergone major surgery (total abdominal hysterectomy/cesarean section or laparotomy) were compared with those who had undergone no prior surgery or only minor operations (laparoscopy or appendectomy). Because of the small number of major vascular injuries, statistical analysis of outcomes was performed grouping all vascular injuries together. Univariate analysis demonstrated that prior abdominal surgery had no relation to time to exposure (72.4 minutes vs 67.8 minutes; P = .19), vascular injury (27.8% vs 21.0%; P = .10), or perioperative complications (18.5% vs 15.3%; P = .36) (Table 4). There were no statistically significant differences when a dichotomous analysis of any prior abdominal surgery vs no prior abdominal surgery was performed (data not shown). The influence of BMI on patient outcome was evaluated by comparing obese patients (BMI ≥30) with nonobese patients (BMI <30). Obesity did not lead to an increased time to exposure (66.7 minutes vs 71.9 minutes; P = .33). However, obese patients had a significantly higher risk of vascular injury (30.8% vs 19.7%; P = .007) and perioperative complications (21.4% vs 14.0%; P = .04) (Table 4). The influence of the level of spine exposure on outcomes was also evaluated because of the potentially treacherous anatomic relationships of the L4-5 disk with the aortic bifurcation and iliac vein confluence. Cases involving any exposure of L4-5 (61.5%) were compared with those not involving this level. Exposure of the L4-5 space increased time to exposure (77.0 minutes vs 56.2 minutes; P < .001) and vascular injury (29.7% vs 13.1%; P < .001) but had no effect on overall complication rates (14.3% vs 19.7%; P = .13) (Table 4). A similar relationship was seen when examining procedures involving multiple vs single spinal level exposures: increased time to exposure (multiple vs single: 79.8 minutes vs 56.9 minutes; P < .001) and vascular injury (multiple vs single: 32.0% vs 13.2%; P < .001) but no effect on overall complications (multiple vs single: 18.8% vs 13.6%; P = .13). Multivariable logistic regression analysis confirmed that prior abdominal surgery had no effect on time to exposure, vascular injury, or overall complication rates. A BMI of 30 or more significantly increased the risk of vascular injury (odds ratio, 1.82; 95% CI, 1.16-2.84; P = .009) and complications (odds ratio, 1.69; 95% CI, 1.03-2.79; P = .04). Exposure of the L4-5 disk space increased the risk of vascular injury (odds ratio, 2.76; 95% CI, 1.67-4.55; P < .001). Exposure at the L4-5 level was the only factor that led to increased operative exposure time (F ratio, 24.75; P < .001). The role of the exposure surgeon is to provide safe and adequate spinal exposure. The disk spaces must be appropriately exposed to allow placement of hardware and avoid injury to adjacent structures. Prior abdominal surgery makes repeated operations difficult, but the magnitude of increased difficulty varies by report.16-20 Typically, transperitoneal surgery does not lead to retroperitoneal adhesions. However, the presence of any abdominal incision may make exposure surgeons hesitant to offer anterior exposure to patients with abdominal scars. Our data suggest that prior abdominal surgery does not increase the risk for perioperative complications or vascular injury. Using the time to exposure as a surrogate for operative difficulty, prior abdominal surgery had no effect on the technical challenge of exposure. In this series, the most common types of prior surgery were total abdominal hysterectomy and cesarean section. Even prior laparotomy for other pathology did not adversely affect the conduct of the exposure in any measurable way. 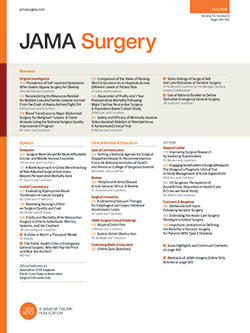 In most types of surgery, including spine surgery, obesity is a known risk for perioperative complications.3,5,7 Nearly one-third of the general population of the United States is considered obese (BMI ≥30), and the population in this report is typical.21 Our current report finds an increased risk of complications in this group, but spine exposure can be performed with no significant increase in operative time. The spinal literature suggests that while obesity increases the complication rates, the long-term results of spinal surgery are equally good in obese and nonobese patients.10 In our series, obesity may make the operations more difficult for the exposure surgeon, as evidenced by an increased vascular injury rate, yet this was not reflected in additional time to obtain exposure. In light of these findings, obesity should not be viewed by the exposure surgeon as a contraindication to anterior surgery. The observation that obesity increased vascular injury risk but not operative time likely reveals the fact that most injuries were minor and therefore added a nonsignificant amount of time to the operation. Also, 55.0% of vascular injuries occurred during instrumentation and therefore would not be reflected in time to spine exposure. Technically, exposure of L4-5 remains a challenge. Vascular anatomy dictates that exposure of the L4-5 disk involves significant manipulation of vascular structures. The management of the ascending lumbar vein or iliolumbar vein and other tributaries was not specifically documented but presumably these venous tributaries play a role in the increased vascular injuries at L4-5. Awareness of the venous anatomy is key to the safe performance of these procedures. The increased risk of vascular injury in these exposures has been well documented and it is advised that the exposure surgeon remain present during instrumentation because the major injuries occur at this point in the operation.11,13 In the current report, the exposure of the L4-5 disk was the only factor significantly influencing the time to exposure, which was used as a measure of operative challenge. Our group will see all the patients preoperatively and make a thorough evaluation to assess the risks of anterior exposure. Prior surgery, aortoiliac disease, and overall comorbidities are carefully assessed. In the years of the study, only 2 patients were denied anterior approach by our service because of extensive aortoiliac occlusive disease in one case and a pelvic horseshoe kidney in another. Prior abdominal surgery, including prior retroperitoneal surgery, is not an absolute contraindication. Another policy we have adopted is for the vascular surgeon to remain in the room during the entire case because of the potential for vascular injuries during instrumentation. In conclusion, prior abdominal surgery should not be considered a contraindication for anterior retroperitoneal approaches to the lumbar spine. Caution should be exercised in obese patients and in exposures involving L4-5 because obesity increases the incidence of vascular injuries and perioperative complications and L4-5 exposures take longer to perform. However, with careful preoperative consideration of these risk factors, ARES can be safely achieved with low morbidity. Correspondence: Ahmed M. Abou-Zamzam Jr, MD, 11175 Campus St, Ste 21123, Loma Linda, CA 92354 (azamzam@llu.edu). Accepted for Publication: April 12, 2012. Author Contributions:Study concept and design: Bianchi, Chiriano, Patel, Teruya, Lum, and Abou-Zamzam. Acquisition of data: Mogannam, Chiriano, and Abou-Zamzam. Analysis and interpretation of data: Mogannam, Lum, and Abou-Zamzam. Drafting of the manuscript: Mogannam, Chiriano, Patel, Teruya, Lum, and Abou-Zamzam. Critical revision of the manuscript for important intellectual content: Mogannam, Bianchi, Chiriano, Patel, Teruya, Lum, and Abou-Zamzam. Statistical analysis: Mogannam, Lum, and Abou-Zamzam. Administrative, technical, and material support: Patel and Abou-Zamzam. Study supervision: Bianchi, Chiriano, Teruya, Lum, and Abou-Zamzam. Previous Presentation: This work was presented as a poster presentation at the 83rd Annual Meeting of the Pacific Coast Surgical Association; February 18, 2012; Napa Valley, California.